Combine the Cream, Milk, Sugar, and Vanilla in a saucepan over medium heat. Heat until the mixture just starts to boil, remove from the heat. Put the egg yolks in a large mixing bowl, then temper the yolks with a little of the milk mixture. Combine the two mixtures. then return them to the saucepan over medium heat, stirring constantly. Cook the custard until it coats the back of a wooden spoon, 2-4 minutes, DO NOT BOIL. Strain into a mixing bowl and refrigerate until chilled, at least a few hours (you want it very cold before it enters the ice cream machine). Meanwhile, combine the Creole Cream Cheese and Sour Cream then put them through a fine mesh sieve, mashing them through with the back of a wooden spoon. 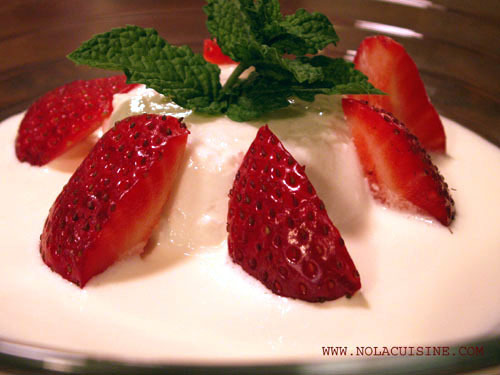 When the custard is cold, fold in the Creole Cream Cheese and Sour Cream. Freeze in an ice cream maker according to the manufacturerâ€™s instructions. Serve as is or freeze overnight for a firmer ice cream. Add the ingredients to a heavy bottomed saucepan. Cook over medium heat, stirring occasionally, until the strawberries break down slightly, and the sauce reduces a bit. Chill. I also added some additional chopped fresh strawberries to the cooled sauce for more texture. 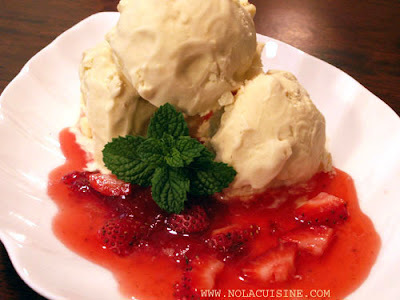 Be sure and check out my ever growing Index of Creole & Cajun Recipes which features links to all of the recipes on this site.